This post is about filling in the various areas of your vector shape with color and is an unoffical followup to the Sketches to Vector tutorial where the topic was how to scan and trace your sketches. 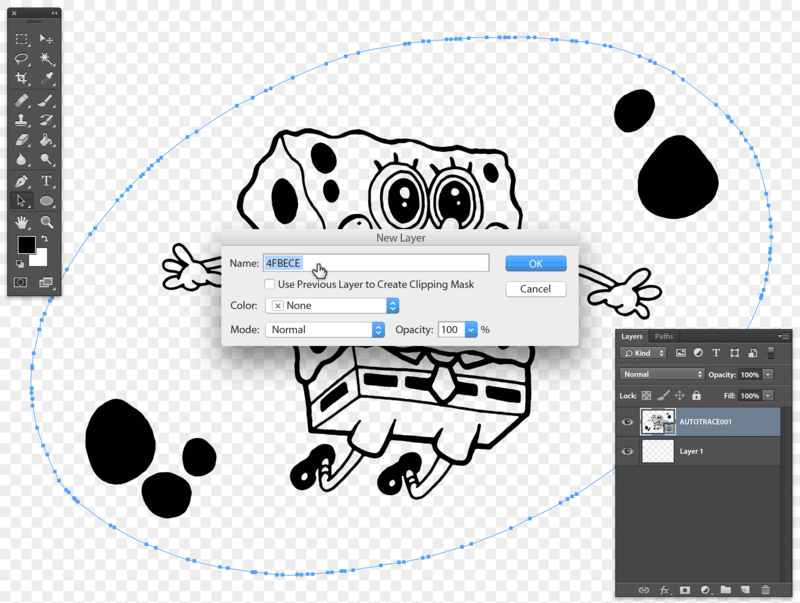 Stipplr Actions do not currently support automatically converting your sketches or photos into image traces with vector color shapes — although there are some proof of concept CYMK Actions which are being tested. Unlike Illustrator, Photoshop does not have native support for image trace, but with some creative tap dancing we can simulate results that are more than acceptible to use as filler content for a project — in some cases even as final artwork. Stipplr Actions are presets that prepare the selected source image in a specific way so that an expected result takes place — in the case of this tutorial we want a simple way of separating the line work from the background via a quick image trace applied to the source image. Stipplr Actions are not a replacement for Illustrator’s image trace feature, they are meant for designers who do not have access to Adobe Illustrator but have a requirement to convert images into vector shapes. Stipplr Actions performs a similar result to Adobe Shape CC in that they both generate a vector shape result from raster data. 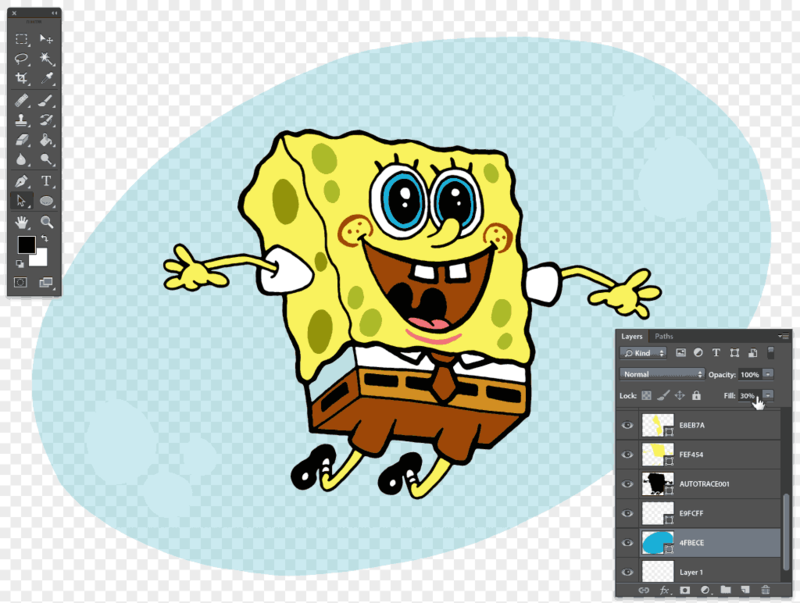 This post has very little to do with Stipplr Actions and focuses mainly on how to systematically tear down a complex vector shape — in this case we’ll learn how to color Spongebob in the process. Those reading this article for the first time may feel like this is a lengthy process, but in reality it only took 15 minutes to go from the line drawing into the full colour composition you see above. 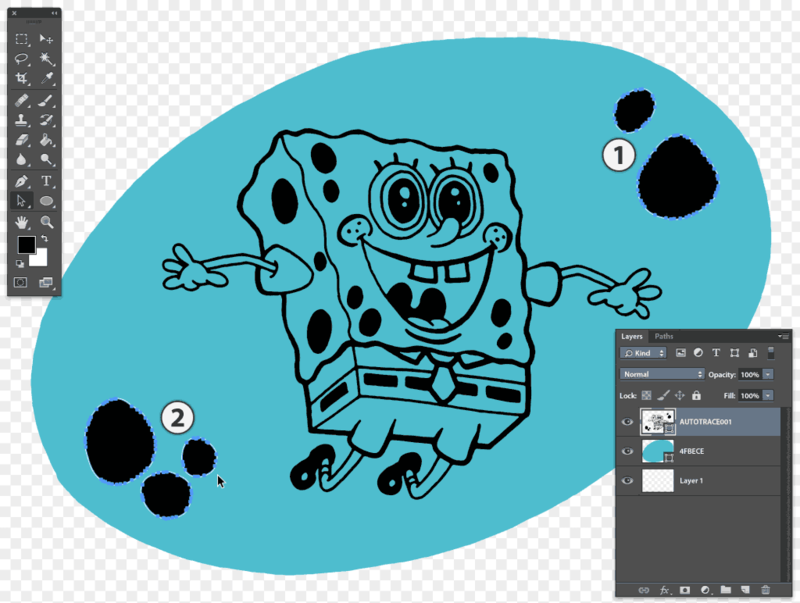 If you would like to follow along with this tutorial you will need to download the Spongebob linework and run the Stipplr Action AUTOTRACE001 on it which will generate the vector shape layer we will be using. One of the core disadvantages of Photoshop vector shapes is that applying layer effects can be overwhelmingly disapointing at first. This is because a complex vector shape in Photoshop acts much like a set of grouped shapes do in Illustrator, which is fine, but Photoshop lacks the tools to ungroup these conjoined shapes. They are seemingly combined as a single entity, and applying a colour to the vector shape will make the entire vector shape that same colour which is no different than adding a colour to a set of grouped elements in Illustrator, they all become that same colour. 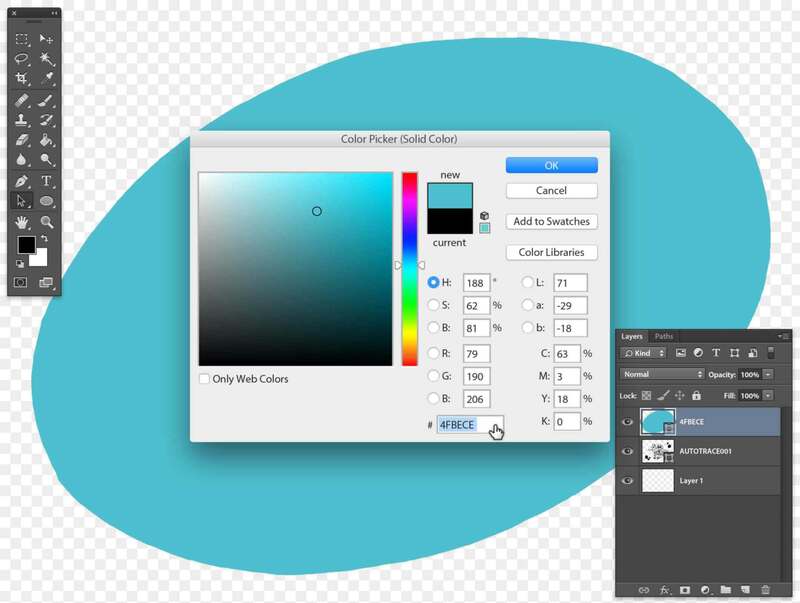 Photoshop’s vector tools are used to create vector shapes as well as clipping paths, but when complex shapes are created what we get is a series of shapes all excluding and subtracting each other making it impossible to selectively fill in specific colours on specific shapes. The trick is to tease these shapes apart to their own layers where we can apply colours independently — in essence, we are going to manually ungroup the shapes. To start colouring the vector shape we first need to get to the vector shape so we can start teasing apart the shapes. Knowing when you are editing a PSB is quite simple. 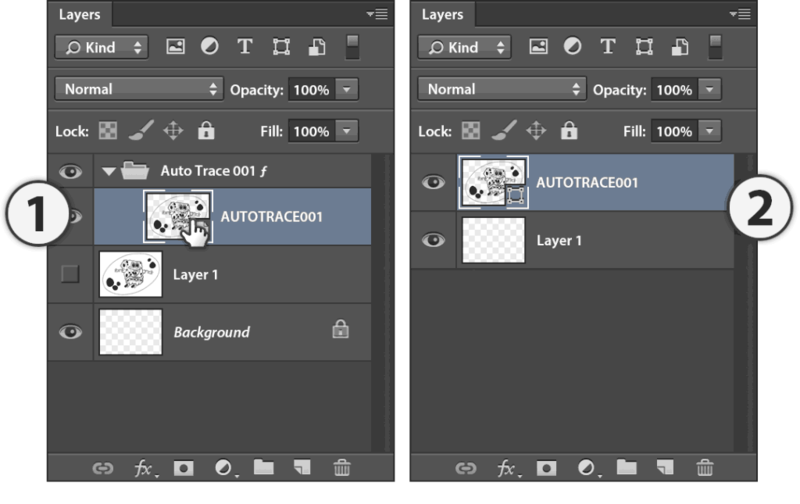 In the image above we can already spot the differences between the PSD Layers panel on the left and the PSB Layers panel on the right. Also, the name of the PSB document will have the same name as the Smart Object you double-clicked on. Unlike the shot above, the Smart Object layer name and the vector shape layer name in the PSB document can very easily be different (they just happen to be the same here). In the image below we can see that the name in the document tab also ends with the .psb suffix, this is another indicator that we are not in the main PSD but rather editing a PSB. If you are new to Smart Objects this might be a little disorienting, but when you edit a Smart Object it always happens in its own document within Photoshop and in some cases an entirely different application. Anything you do in this PSB document will get saved and will appear in your main PSD when you close the window or use the document tabs to jump back to your PSD. 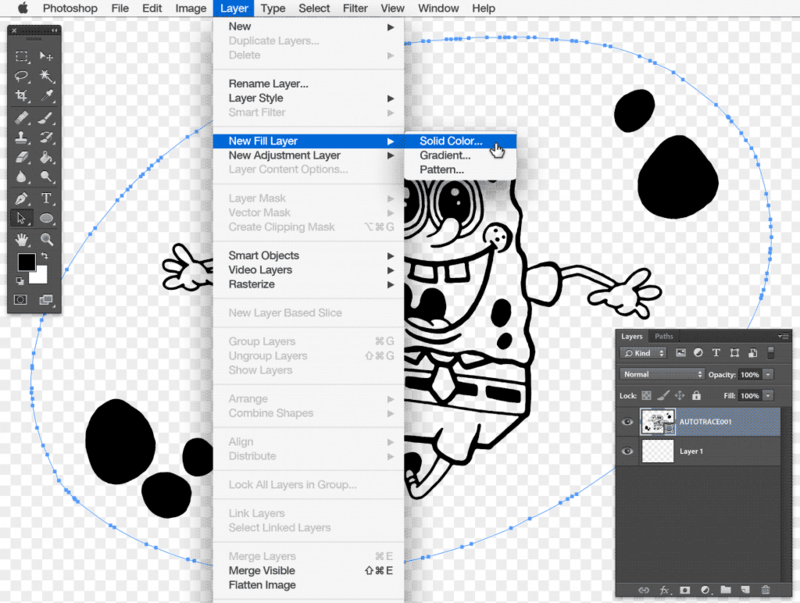 Please note that some Smart Objects can trigger Illustrator to launch, and as of CC you can save Smart Objects as files to the file system which are linked to from multiple PSD files. It can get pretty hairy if you don’t have a handle on how Smart Objects work — head over to Adobe’s site to read the post “Working with Smart Objects” for a primer lesson. 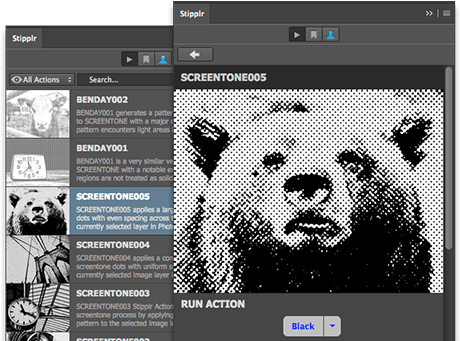 Stipplr itself only generates Smart Objects that are stored within your PSD and open a PSB to edit. Nothing fancy and nothing to keep track of on your disk. With the PSB open it’s time to start teasing the shapes apart. During the process of separating the shapes to their own layers we will also need to delete shapes we don’t need. For example, the very first shape we are selecting is a shape we need to delete. Why? 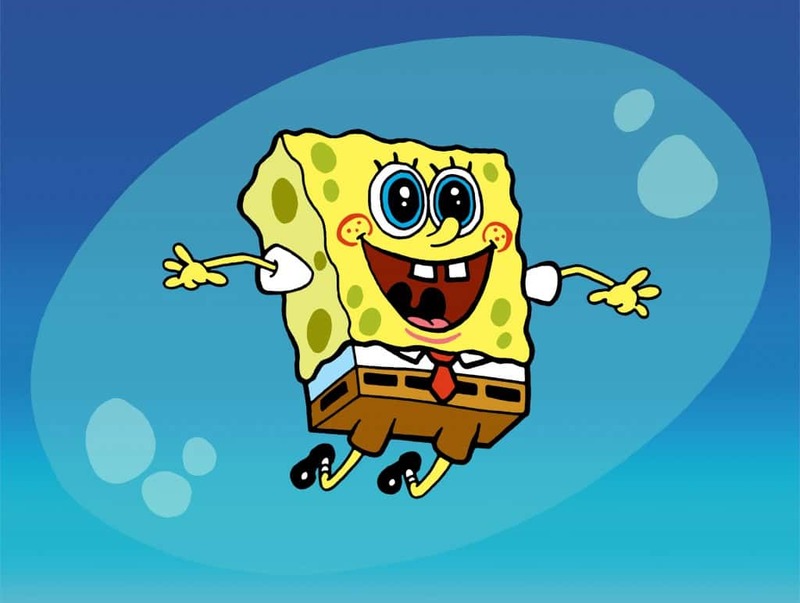 Well, we want to have Spongebob appear to be floating within a large bubble of air within the ocean, however, what was drawn on paper was simply a elliptical line. In order to convert this line into a solid ellipse shape we need to delete the inner ellipse shape. Using the Path Selection Tool, select the inner shape. Deleting the inner ellipse path forces Photoshop to change how it was rendering the vector shape, this is because we just deleted a path which was providing an exclusion function. In essence, that ellipse path shown in STEP 3 wasn’t really a thin solid line but rather 2 large ellipse paths where the inner path was excluding the larger outer path. With the inner path gone, the outer path which is also providing an exclusion function, appears to have completely altered the path shapes within it with an inverted effect. 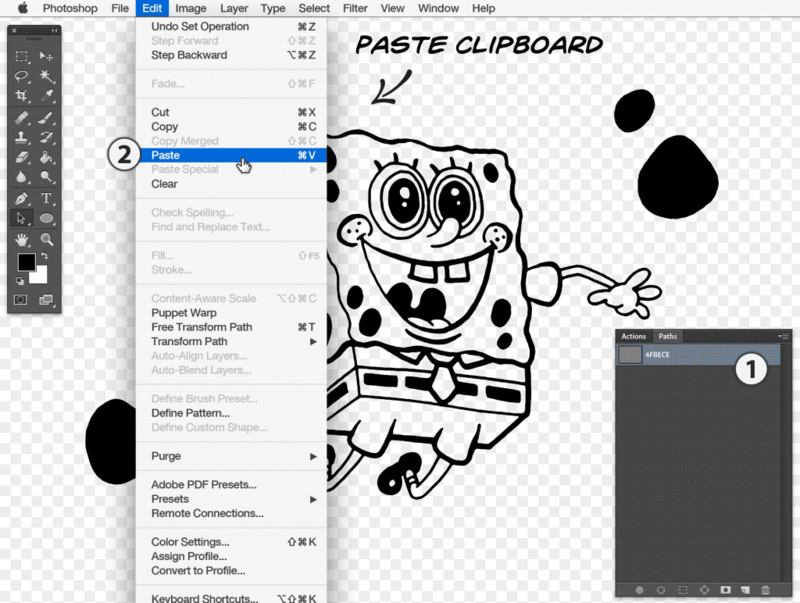 Now we are ready to start separating shapes — using the menus, or keyboard commands, Cut the shape to the clipboard. With the bubble ellipse path cut from the vector shape, the exclude effect it was having on the shapes within it reverts back to normal. 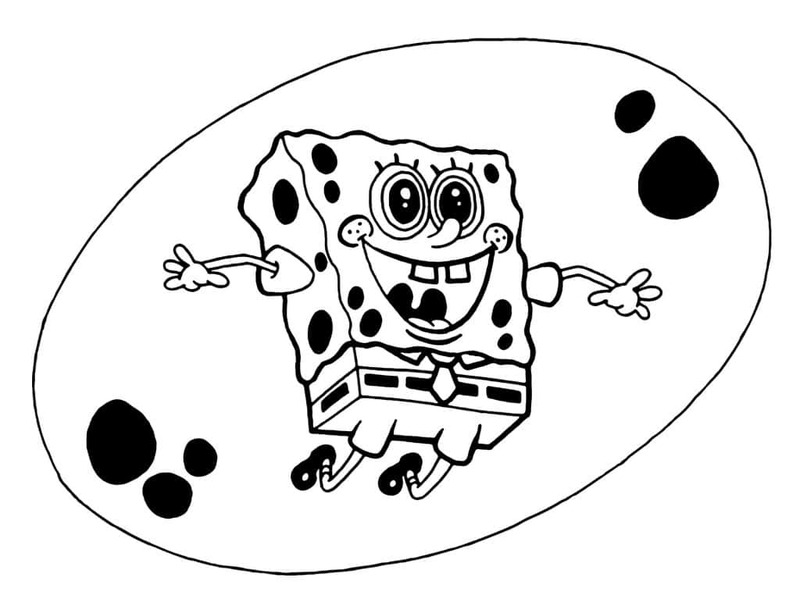 We are now ready to place the ellipse, which is currently in the clipboard, onto its own layer as a new vector shape. If the Paths panel is not already open, go to the Window menu to open it. Here is the Paths panel. 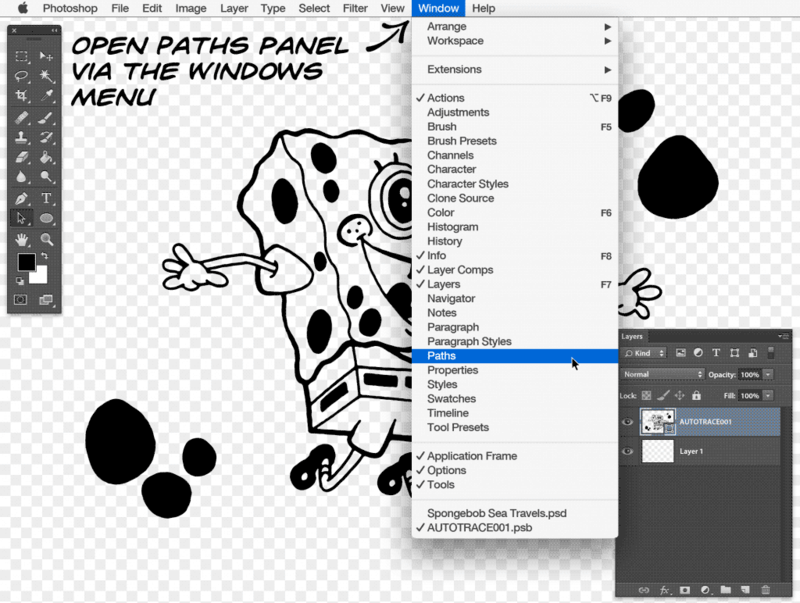 Depending on how proficient you are with Photoshop you may already have some paths created in your document that will appear when this panel opens. For the purpose of this tutorial we’ll assume there are no paths in this panel. What’s with the bizzare path name? It’s the HEX value for the colour we will assign the path shape momentarily. When splitting out the shapes to their own layers I like to split them based on colour which allows me to create fewer layers. For example, a vector shape layer named FFFFFF (white) will contain Spongebob’s eyes, teeth, shirt and sleeves all on one layer as opposed to using 4. It’s just simpler. 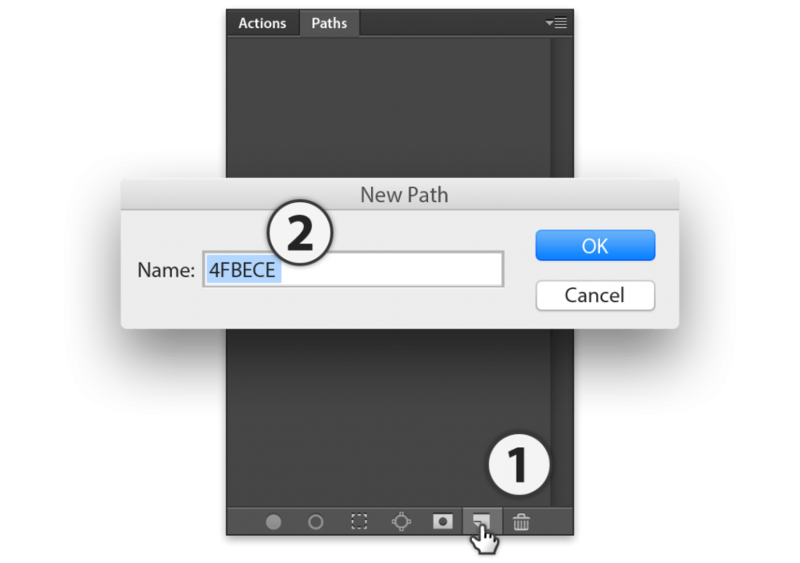 With the newly created Path layer we must now paste the ellipse path either via keyboard shortcuts or by using Photoshop’s Edit menu to paste the clipboard. As soon as we perform the Paste command the path appears on our canvas — and as an added bonus paths are generally pasted in the exact same location from where they were cut, this saves us time not having to relocate the object. If you are a long time user of Photoshop you’ll already know that simply pasting the ellipse path to its own Path layer does not automatically create a vector shape layer for us. 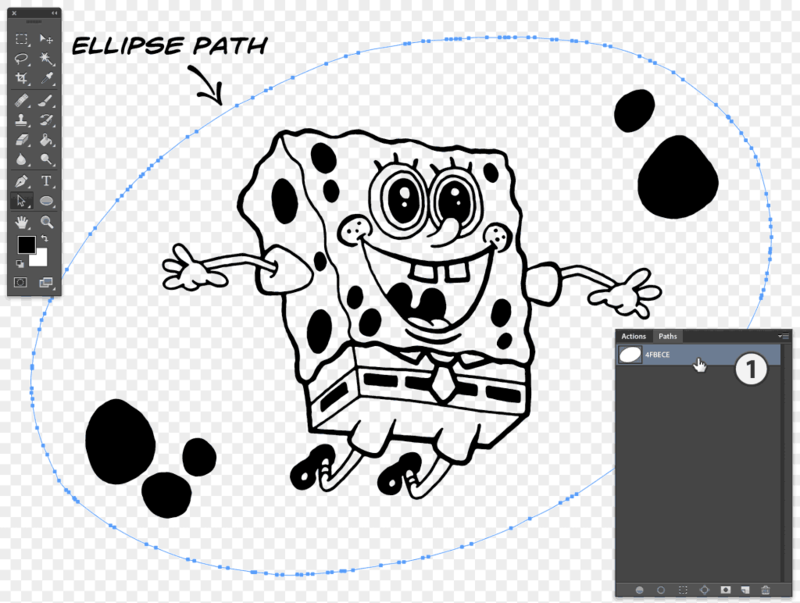 If we were to toggle to the Layers panel for a quick peek we would not see a new vector shape — the ellipse path needs one minor adjustment to turn it into a vector shape. 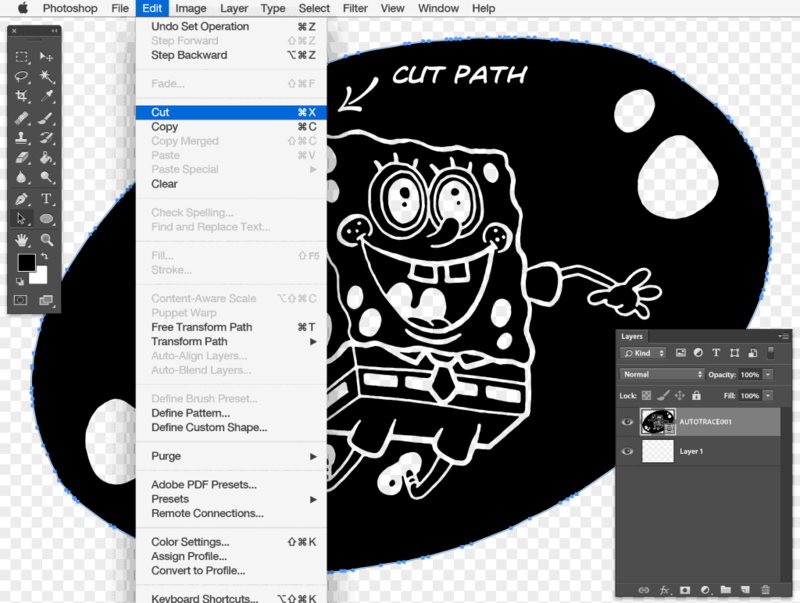 Without switching back to the Paths panel, we can simply convert the path to a vector shape layer by using the Layer menu and selecting the Solid Color… sub-menu option. To avoid confusion I’ll just state here that, yes, selecting Solid Color… opens a modal named New Layer where you are meant to to assign the definitive name you would like to apply to your new vector shape layer. With the name entered into the field (again, I still use the Hex value #4FBECE), the moment you press OK the New Layer modal will be replaced by the Color Picker modal where we will choose the Solid Color to be applied to this new layer. When a path is converted to a vector shape it is often placed on the layer above the vector shape where the path was cut from. In this case we cut the ellipse from the AUTOTRACE001 source layer, and because the AUTOTRACE001 source layer remained selected while we worked in the Path panel to create a new path, the new vector shape was subsequently placed above our AUTOTRACE001 result. Depending on how closely you are following this tutorial, the layer on which the ellipse vector shape was placed may vary in your situation. Keep in mind that the AUTOTRACE001 vector shape layer contains all the path shapes we need to reconstruct a multi-layered result, but what the AUTOTRACE001 layer does not contain is the hierarchical order in which these shapes must be placed. Therefore it is up to you, the designer, to manage this manually while your are extracting the various shapes. 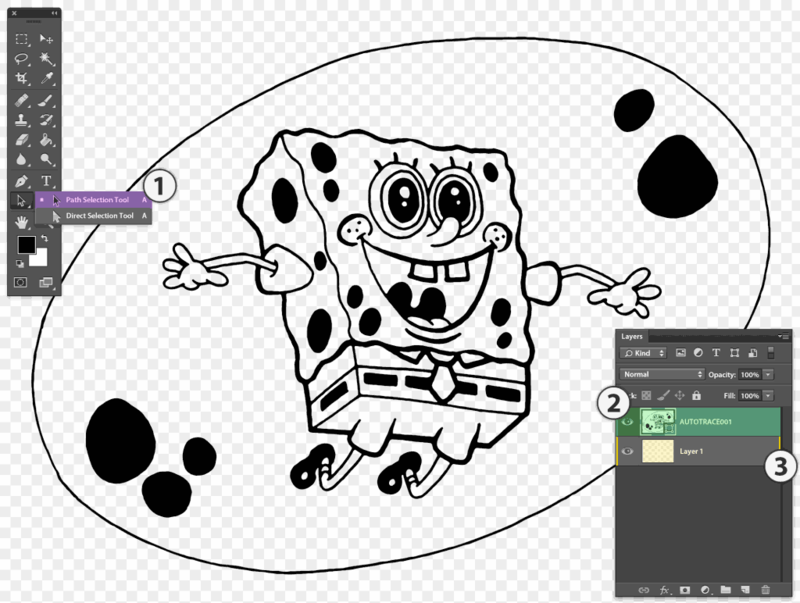 With the ellipse vector shape layer in its correct location, we see Spongebob back at the top of the composition. Each STEP which follows below will be a condensed version of STEP 2 through STEP 15 above — the only difference will be that we are targetting a new shape in each step, assigning the colour and placing it on the appropriate layer. 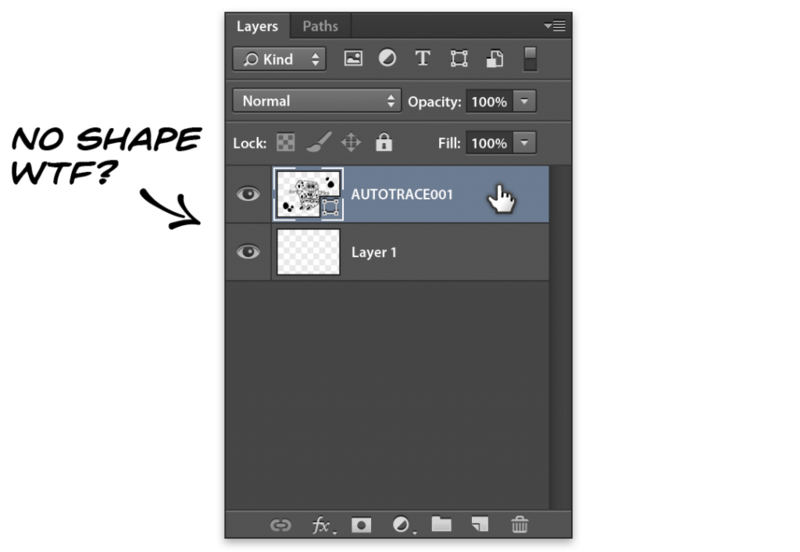 We can save a few steps and work faster by converting the paths we cut to the clipboard directly in the Layers panel. The Instructions for using the Path panel in the steps above are correct but ultimately unnecessary, they were added as an introduction to Paths for novice Photoshop users — the Actions on this site are tied closely with the Paths panel and everyone should have some awareness of the Paths panel to ensure there is no mystery around Stipplr Actions. With the Path Selection Tool, hold down the Shift Key and select all 5 smaller bubble shape paths, shown here in 2 small groups. And here is a refined process to achieve the same result as STEP 2 through STEP 15. Done. We acheived the same results in just 9 steps as we did in STEP 2 through STEP 15, a saving of 6 whole steps! 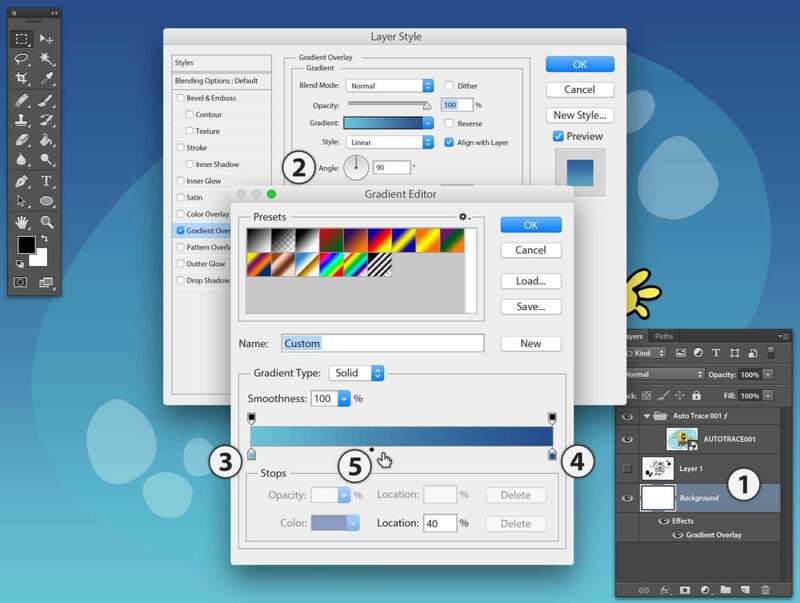 The purpose of Layers in Photoshop are conceptually the same as those in Adobe Illustrator — designers place shapes on individual Layers which are then layered in a precise order so that the resulting composition is viewed the way it was intended. 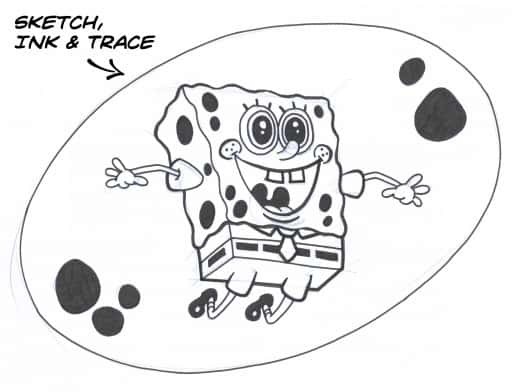 In the case of Spongebob, we just placed the only 2 Layers which appear behind him, all our remaining shapes which make up the rest of Spongebob such as his eyes, cheeks, mouth etc, will now be placed in the Layers above AUTOTRACE001. Using the Path Selection Tool, select only the path which represents the side of the shirt. Done, and with even fewer steps than STEP 16. 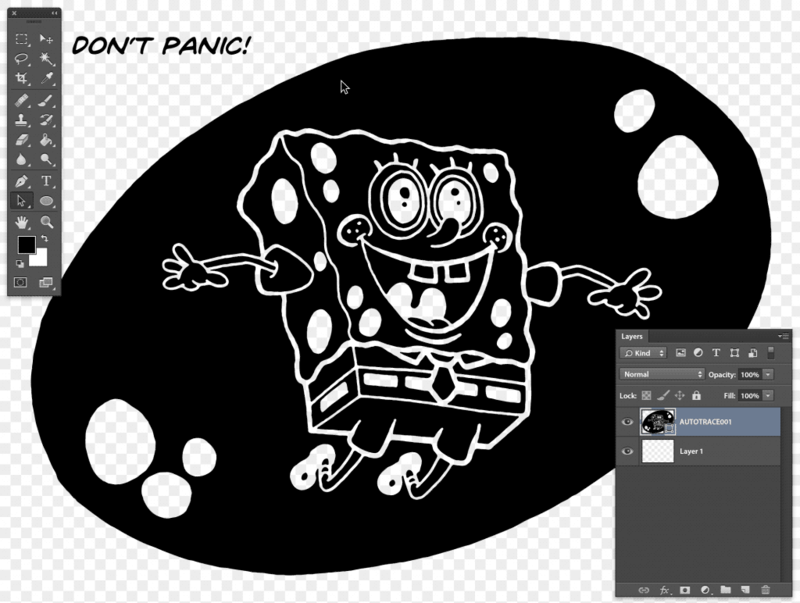 Notice that I didn’t mention having to select Layer AUTOTRACE001, this is because from this point on all the New Layers we need will be created when AUTOTRACE001 is selected. Each New Layer will push the previous one up in the Layer panel. Returning to layer AUTOTRACE001 we will now select the paths representing the portion of the eyes which are blue. And now for the largest path selection in this tutorial, using the Path Selection Tool with the Shift Key to select all 21 paths that, combined, represents all the white filled areas such as shirt sleeves, socks, shirt, teeth and others. Return to Layer AUTOTRACE001 and select the paths representing the cheeks as well as the tie. Now for the pants path shapes — because the front of Spongebob’s pants is a different shade than the side and bottom portion, we’ll only select the 2 paths as displayed in the image below. Yes this is repetitive work, but it’s taking longer to read it than it does to complete. End to end it took less than 15 mins to go from the single vector shape AUTOTRACE001 layer to fully blown out colour composition — once you get into it then the work moves really quickly. 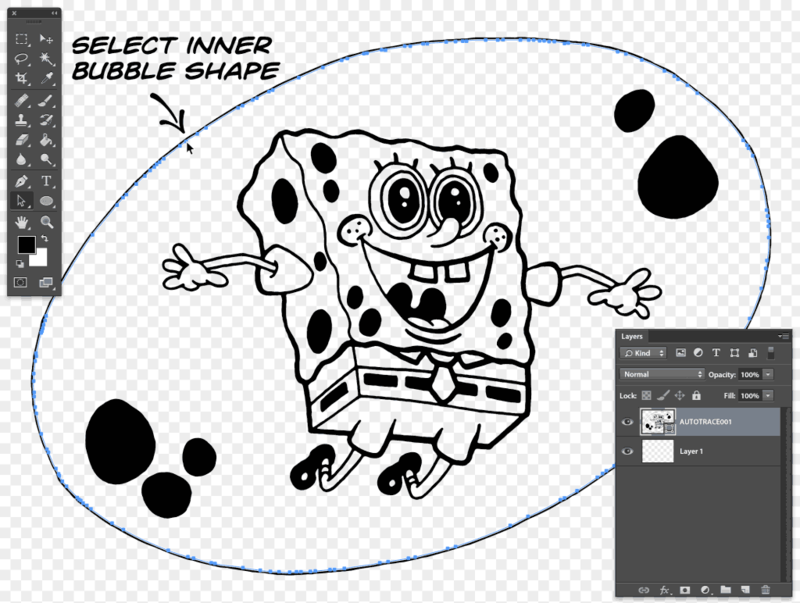 If you are following along and trying this in Photoshop then by now you are very likely extracting paths to vector shapes fairly easily. 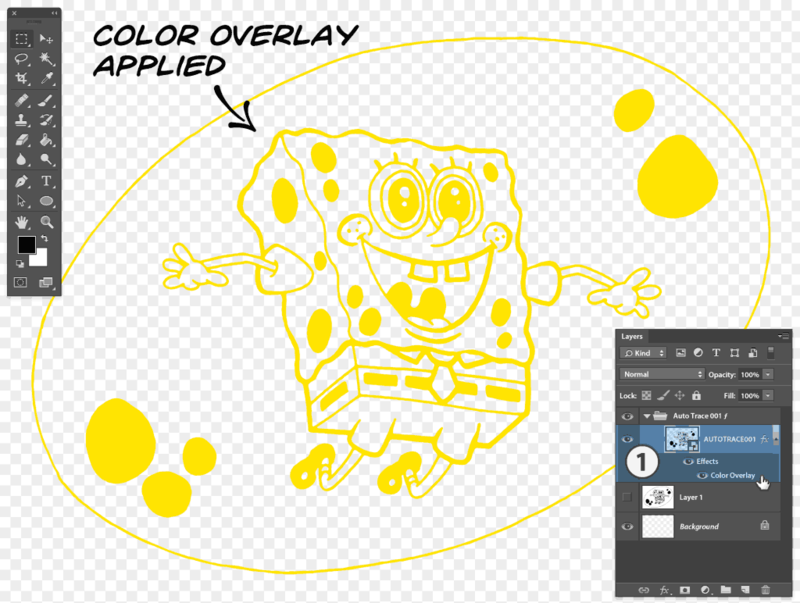 Below is what my Layers panel looks like when each path has been extracted to its own vector shape layer (you can use this as a visual guide to finish the composition). 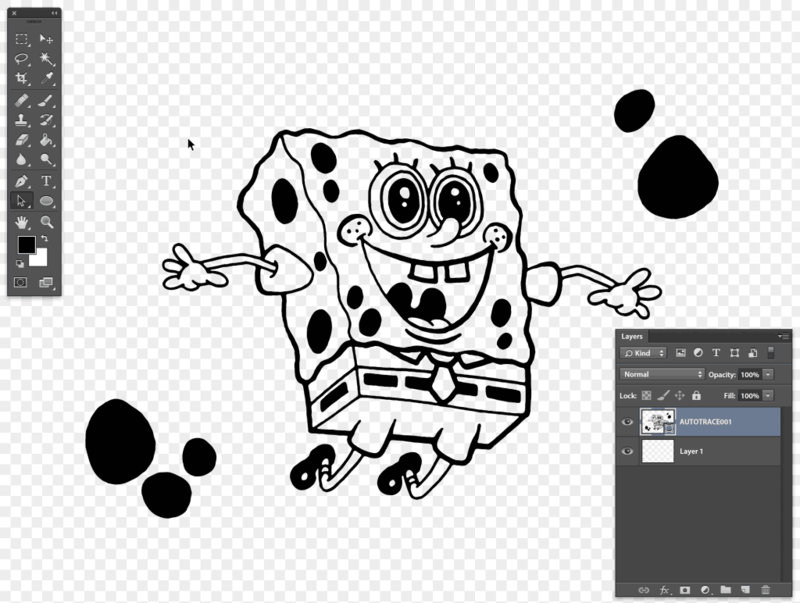 In the shot above, the AUTOTRACE001 source layer is just a shell of its former self after it is exploded out to individual vector shape layers — only the path which outlines SpongeBob’s form is left! And here is what the composition looks like built up as an animation. 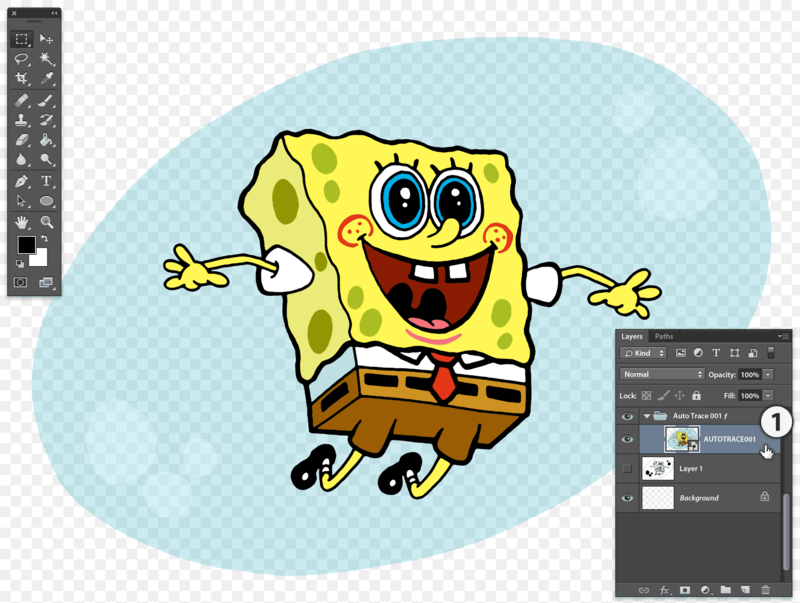 To complete the composition we only need to add the familiar background sea gradient behind Spongebob — we’ll do that in the PSD (we are still in the PSB at this point). If we imagine adding a background gradient to represent the sea it would be blocked by the large pocket of air that Spongebob is floating in. 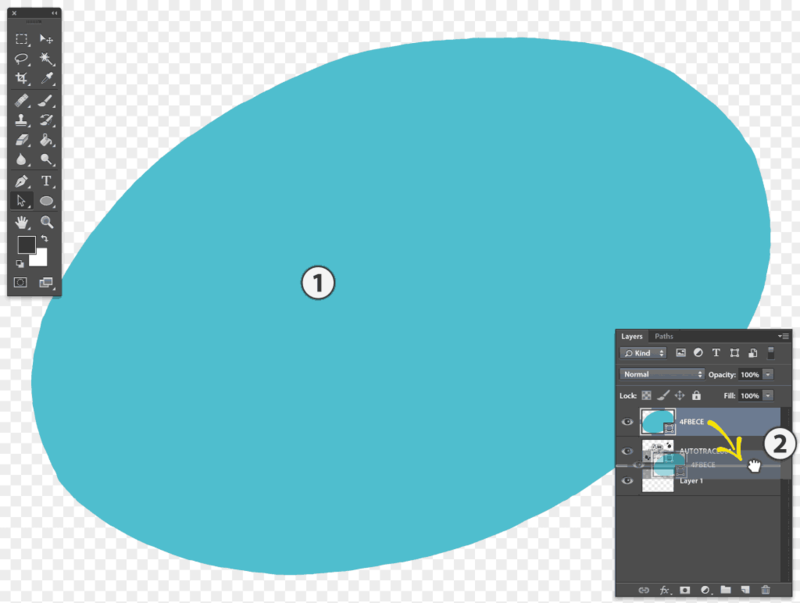 We need to fix this before jumping back to the PSD where we’ll add the sea backgrdrop — go ahead and set the original ellipse shape, the turquoise bubble, between 30% to 50% Fill. Lastly, Save and Close the PSB file and return to the original PSD we started from. Once back in the PSD we can see that the AUTOTRACE001 Smart Object now has a coloured preview. The composition is almost complete, all that’s left is to add the gradient fill on the background layer to represent the sea in which SpongeBob’s bubble is floating. And finally, here is a comparison between the resulting coloured Adobe shape vector layers against the original source (which is actually a Stipplr vector trace from a previous tutorial). 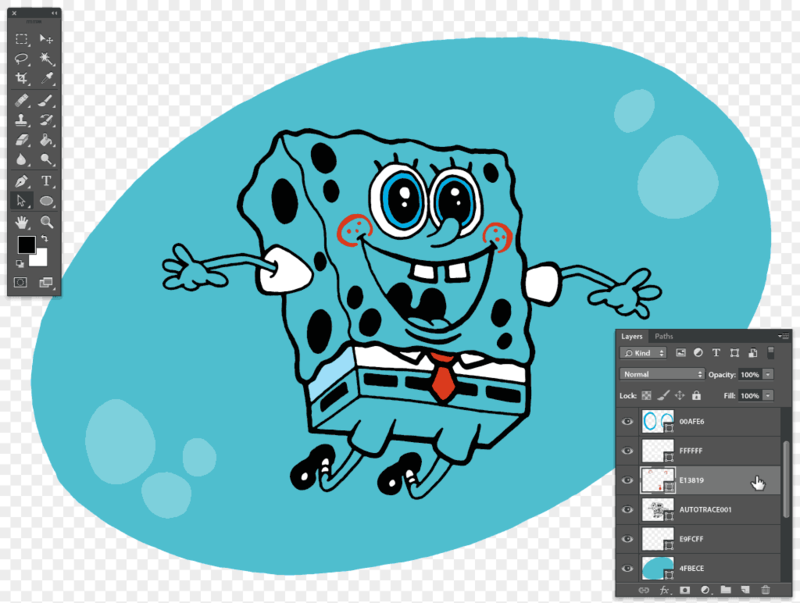 Extracting paths from a vector shape to create individual vector shape layers can look time consuming but is actually quite easy and very handy in situations where you don’t have access to the source vector illustration.